The pairings of Margaret and Henry, and Helen and Leonard, attempt to cross fault lines widened by class, and the tragedy of Howards End is in the absolute necessity and absolute inefficacy of doing so at their moment in history. 143 min. Sony Pictures Classics. Director: James Ivory. Cast: Anthony Hopkins, Vanessa Redgrave, Helena Bonham Carter, Joseph Bennett (II), Emma Thompson. The train of a grand old dress drags through the grass at twilight. It's magic hour at Howards End, and the melancholy Mrs. Wilcox senses her days of wine and roses are literally and figuratively near an "end." So begins the Merchant Ivory film of E.M. Forster's novel Howards End. The scene perfectly primes us for the sumptuous and heartrendingly poignant story to follow, one that's sensitively scripted by Oscar winner Ruth Prawer Jhabvala and elegantly brought to life under the aegis of director James Ivory and his invaluable producing partner Ismail Merchant. 1910 England. The country estate Howards End is the family home of Ruth Wilcox (Vanessa Redgrave), and she's the only Wilcox who appreciates it as more than a brick-and-mortar waystation between business deals and civil ceremonies. So when circumstances conspire to bring together the terribly ill but "well-off" Ruth and the hale, bourgeois Margaret Schlegel (Emma Thompson, in a worthy Oscar-winning performance), Wilcox seizes on the opportunity to make someone understand how so much depends upon the rustic charm and fond memories of Howards End, an island of sanity in a cruel world. Though sufficiently intrigued, Margaret misses her opportunity to see the estate before Ruth passes, and the surviving Wilcoxes—husband Henry (Anthony Hopkins) and children Charles (James Wilby), Paul (Joseph Bennett) and Evie (Jemma Redgrave)— conspire to ignore the matriarch's dying wish: for Margaret to inherit Howards End. Matters further complicate when Henry—the calculating and imperious head of the Imperial and West African Rubber Company—gets it in his head that Margaret would make a suitable and easily won mate for a swift remarriage. Though she's an otherwise independent-minded supporter of women's suffrage, Margaret allows herself to feel a combination of pity and flattery at Henry's advances, which also carry with them the promise that financial worries will disappear. Unfortunately, Henry has utterly failed to charm Margaret's younger sister Helen (Helena Bonham Carter), who becomes particularly appalled when Henry's blithe and reckless career advice for Helen's lower-middle-class friend Leonard Bast (Samuel West) results in his ruin. Howards End is such an unqualified success because it marries complex source material with interpreters who completely understand it. Forster's novel works equally well as an intellectually devastating allegory of Edwardian England—in hindsight, perched on the precipice of major social change while still sadly defined by its rigidly divisive class structure—and as an emotionally devastating psychological character study. Prawer keenly weaves both agendas through her narrative without a hint of the blunt obviousness found in most "important" awards-season films: we come to believe in these characters and, more importantly, to see them as more than one-dimensional stand-ins for singular qualities. The pairings of Margaret and Henry, and Helen and Leonard, attempt to cross fault lines widened by class, and the tragedy of Howards End is in the absolute necessity and absolute inefficacy of doing so at their moment in history. Margaret aptly sums up her world: "I'm afraid that in nine cases out of ten, nature pulls one way and human nature the other." Though human-natural romance is a dead end in the story, Howards End always keeps sight of the romance of being alive in nature. Inspired by George Meredith's The Ordeal of Richard Feverel, Leonard Bast clings to reveries of being liberated from his drudgery, as an insurance clerk and indentured husband, to walk through fecund greenery toward sunlight. And while human beings consistently muck up the simple pleasures of life, Howards End is ever waiting to deliver them. 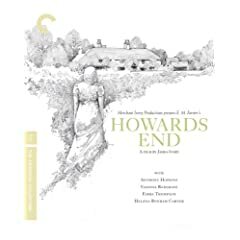 Responding to the fan decision of a recent poll requesting feedback on its next Blu-ray release, Criterion delivers a lovely special edition of Howards End. The jewel in the crown is a high-definition transfer created from the original 35mm interpositive, supervised by cinematographer Tony Pierce-Roberts, and approved by director James Ivory. The results are—as expected—wonderful. The film grain is a bit more prominent than some will like in a Blu-ray release, but it's entirely accurate to the original look of the film, shot on a humble $8 million budget. Color, contrast and detail are all entirely satisfying and digital cleanup has aided in removing undesirable dirt, jitter, and flicker; for a film of this vintage, Howards End looks quite fine and unrquestionably better than it ever has before on home video. Similarly, the LPCM 5.1 surround mix, remastered from the 6-track magnetic soundtrack, expertly cleans away the cobwebs to do full justice to the sonic potential of the film. Those looking for a film school in a box in reference to the oeuvre of Merchant Ivory might well begin with Criterion's BD of Howards End. Though the film lacks a commentary, it would be superfluous for a film that so warmly invites the viewer's own thought process and for a disc with such useful behind-the-scenes featurettes. "Building Howards End" (42:36, HD) is a Criterion-produced making-of featuring interviews with Ismail Merchant, James Ivory, Helena Bonham Carter, costume designer Jenny Beavan, and Academy Award-winning production designer Luciana Arrighi. In "The Design of Howards End" (8:57, HD), Arrighi and Beavan discuss in greater detail their contributions, which are illustrated by gorgeous pre-production art and clips from the film. The 1984 documentary "The Wandering Company" (49:37, HD) explores the then-twenty-year history of Merchant Ivory with rare set footage, extensive film clips, and interviews with Ivory, Merchant, Ruth Prawer Jhabvala and her husband C.S.H. Jhabvala, Felicity Kendal, Jennifer Kendal, Shashi Kapoor, Nickolas Grace, Mamoun Hassan of National Film Finance Corp, Utpal Dutt, cinematographer Walter Lassally, Madhur Jaffrey, and Christopher Reeve. "James Ivory on Ismail Merchant, 2009" (12:11, HD) is a new interview with Ivory that allows him to pay lovely tribute to his late producing partner. "Behind the Scenes" (4:31, HD) is the original EPK featurette for Howards End, including interview snippets with Anthony Hopkins, Carter, Emma Thompson, Merchant and Ivory. Last up is the film's "Theatrical Trailer" (2:05, HD). Of course, the disc comes handsomely packaged with a sixteen-page color booklet comprising credits, tech specs, and an appreciation by film critic Kenneth Turan. All site content © 2000-2019 Peter Canavese. Page generated at 04/21/2019 01:53:02AM.